Congratulations to former Rajadamnern Stadium Champion and Tiger Muay Thai fighter Bernueng Topkingboxing on his impressive showing at the Thailand Vs. Challenger event held in Bangkok Thailand over the weekend. 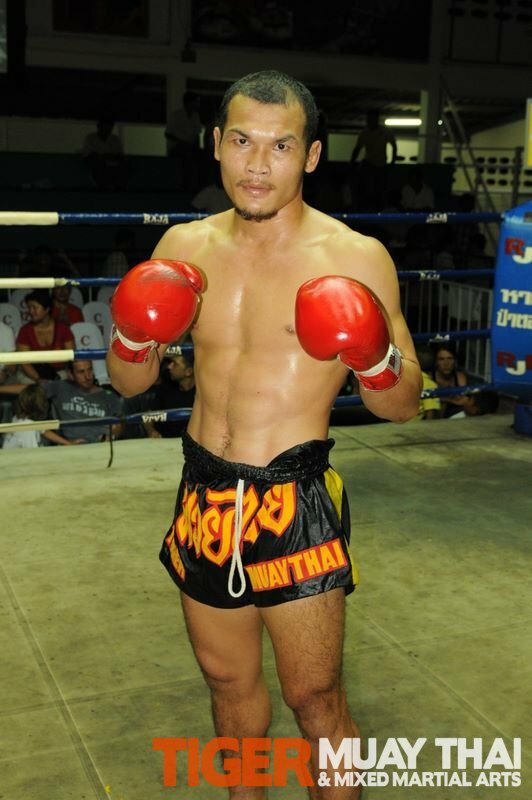 Bernueng, was one of the first Muay Thai-MMA crossovers for Tiger Muay Thai. After a brief career in MMA which saw him compete in Russia and China, Bernueng went to teach Muay Thai in Hong Kong, before returning back to Thailand and signing an exclusive contract with Top Kings Boxing Gym. Facing the tough Manasak, Bernueng dropped him early in the fight before finishing him with an uppercut in round 2. Fans of Tiger Muay Thai will remember Bernueng for his infamous BBQ Beatdown 6 fight against former Lumpinee Champion Sinjok Legacy Gym. Bernueng Vs. Sinjok was the first time in the history of Thailand that two world Champion Thai fighters competed against one another in an MMA fight. Bernueng ended up winning a very close split decision over Sinjok.